The debate about extending the 710 North Freeway is now about 60 years old. Business interests want it and the community presents strong opposition. Those concerned about building the tunnel ask for simple things like cost benefit analysis and projected numbers and can never seem to get any answers, which leaves more questions unanswered. The 6.3-mile freeway tunnel could cost maybe $5.65 billion or maybe $10 billion. Then, the question about whether this tunnel can handle trucks and what would the additional costs be? One group that is pushing the project, but seems to believe that truckers would pay a toll of $14 each way from trucking firms that are known to avoid even paying their drivers. Stay tuned for the next episode of "As the Tunnel Bores", which ranks high in community churning. There are more public meetings rolling out to continue the discussion. There will be a debate between the two mayoral runoff candidates, Pasadena City Councilmembers Jacque Robinson and Terry Tornek. The WPRA, a co-sponsor of the event, has provided some of the questions. The debate will be moderated by KPCC Radio's AirTalk host, Larry Mantle, This event will be televised live of KPAS (channel 3 on Charter and 99 on U-Verse). It will also be streamed via cityofpasadena.net/media and pasadenamedia.tv. Two more Public Hearings have been added for a total of four. Be sure to attend at least one. You can come in at any time and leave at any time. Map viewing will also take place during the Public Hearing time schedule. These are not meetings. Public hearing: 11 a.m.- 4 p.m.
What is happening April 13th @ 6:30pm at the Pasadena City Council Meeting? There will only be one topic for the meeting, the SR-710. No other business will be discussed. A staff report will be given on the SR-710 Pasadena Working Group Recommendations. There will be a vote by the City Council on whether or not to accept or approve the Working Group Recommendations. I have personally hear from Steve Madison's office and was told that Madison will bring up a Resolution for the City of Pasadena to oppose the SR-710 tunnel(s). You support the Working Groups recommendations. Ask them to support a Resolution for the City of Pasadena to oppose the SR-710 Tunnels. Tunnel is prohibitive and a waste of resources that could be used for Public Transit projects. Measure A issue - Some Councilmembers apparently continue to express concern that a vote to oppose the tunnel would go against the voters of Measure A to complete the gap with a Freeway surface route. Measure A never said anything about a tunnel or a toll. The 710 gap issue can be solved using other options. Below is a letter from the WPRA to the Mayor and City Councilmembers regarding the City of Pasadena's Position on the SR-710 North Alternatives. This should give you some ideas as well. The Draft EIR/EIS demonstrates that this alternative does not improve regional traffic. It simply shifts traffic from one part of the region to another. This alternative is not cost effective. Instead of spending billions on an alternative that has minimal benefit, we should invest precious taxpayer funds on environmentally responsible public transportation options. This alternative will have very large negative and permanent impacts on Pasadena’s traffic, air quality, economy and quality of life. 2. Endorse the Pasadena Preferred Alternative recommended by the City’s SR-710 Alternatives Working Group. We agree that a multi-modal alternative including light rail transit, expanded bus service, local street network improvements and bicycle transit, is the preferred alternative. 3. Endorse the Connecting Pasadena Project. The CPP is a citizen-driven effort to develop a vision for revitalizing the SR-710 stub, a barren 35-acre area seized by the State for extension of the SR-710 freeway. 4. Demand that Metro and Caltrans provide a cost benefit analysis for the proposed SR-710 Project for public review. Caltrans has publicly promised to provide such an analysis, including during the California Transportation Commission meeting on December 11, 2013. Cost estimates used in the DEIR released March 6 are general and very puzzling. The SR-710 tunnel estimate is half the cost per mile of its proposed Sepulveda Pass tunnel. There are no contingency provisions, even though failures and cost overruns on such projects are the norm. Failures of drilling equipment and tunnel flooding and collapses have plagued almost half of the world’s large tunnel projects reviewed. The spectacular failure of the Seattle tunnel’s TBM is a recent and real-world example of how TBMs can and do fail. Such a failure would have severe environmental consequences and significantly increase project costs. 6. Agree that Pasadena’s Measure A should not constrain councilmembers’ ability to speak and vote on this critical issue. Specific proposals for connecting SR-710 are before us. At the time of the Measure A vote, the SR-710 project didn’t include tunnels, tolls and trucks. Furthermore, in 1999, one year before the measure was placed on the ballot, the United States District Court for the Central District of California ruled that both the EIR and EIS upon which Measure A was based, were inadequate and issued an injunction against the 710 freeway project (City of South Pasadena et. al. v. Slater (U.S.D.C. Central CA 1999) 56 F.Supp.2d 1106). Plan to attend on April 13th: The City Council Meeting will be held at the Pasadena Convention Center in the Ballroom, a very large venue. A large turnout at this meeting will make a difference. The Council does respond to numbers. We need an audience . A federal court judge presiding over a dispute between the Southeastern Pennsylvania Transportation Authority (SEPTA) and a group seeking to purchase advertising space on SEPTA vehicles has ruled the agency must accept the ads, even if they contain messages that may be disparaging to riders and agency employees. After careful consideration, SEPTA has decided not to appeal this ruling. The agency’s policy was revised in October 2014 to allow SEPTA to reject these types of ads without violating the First Amendment. However, this policy change was made after the American Freedom Defense Initiative's (AFDI) initial request to purchase advertising space and is not applicable in the matter. Consequently, AFDI has executed a contact with SEPTA's advertising management agency, Titan, to purchase advertising space on the side panel of 84 SEPTA buses. The ads will contain what some may view as anti-Muslim messages. These vehicles will be placed in normal inventory rotation throughout the SEPTA service area. The ads will begin appearing on vehicles during the first week of April for a four-week period. "We understand that our decision to not file an appeal will be disappointing to those who will be forced to view the disparaging ads," said SEPTA GM Joseph M. Casey. "We are aware that the presence of the ads could anger the public, but caution that attempts to vandalize the ads or deface SEPTA vehicles will not be tolerated." SEPTA has apologized to its riders and urged them to comment or voice their concerns by completing a SEPTA Customer Service comment form. In the week that the 2,000 tonne cutterhead and drive unit was lifted to the surface, Lok Home, President of The Robbins Company, provides a personal commentary on the project as it has unfolded to date. Seattle is the founding city of The Robbins Company, and a place where I lived for nearly 15 years. I remember commuting on the SR99 viaduct highway while working at Robbins early in my career. The new SR99 Viaduct Replacement Tunnel Project is therefore of great personal interest to me. The industry is all too familiar with Seattle’s SR99 Tunnel and its TBM Big Bertha. Much has been written with regards to the 17.5m diameter TBM needing repairs after about 300m of boring. Robbins was a relatively new entry into the EPB/soft ground tunneling business when tenders were called for the SR99 project in 2011, and we made a concerted effort to get the order for this particular TBM. We teamed up with Japanese TBM manufacturer Mitsubishi Heavy Industries (MHI) to get the order. Robbins has had an association with MHI for more than 20 years, and there are jointly designed machines operating around the world on projects in India, China, the USA, and in more countries besides. MHI has built more than 1,000 EPB machines, and, in my opinion, the Japanese TBM manufacturers are further advanced in EPB technology than their European and American counterparts. During the process of trying to win this order we learned a lot about the geology, as well as the contractors’ TBM specification requirements. The main contractor, Dragados [in JV with Tutor Perini] is very well experienced in soft ground tunneling technology, and it developed a high-level specification for the machine. All of the prospective TBM suppliers were required to quote and, if successful, supply to this standard. We eventually stepped out of the tendering process as the lower prices and greater assumption of contract risk offered by our competitors made the TBM supply on this occasion an impractical business option for us. The current situation at the SR99 project is more positive than the media tends to paint it. The project design consultant performed a commendable job when laying out the tunnel route by building in a contingency plan. Boring through glacial till, even with modern TBMs, is never an easy task, as previous projects like the Brightwater Conveyance Tunnels have taught the city of Seattle. This is doubly so along the Seattle waterfront, which includes man-made fill, utilities, and buried refuse. In such ground, TBMs can encounter rapidly changing geology; pockets of groundwater; abrasive soil; and man-made objects such as unmapped disused pipes; foundation piles; and more. Aware of the problems that can develop while using an EPBM in glacial till under a city with a lot of backfill, the SR99 designer wisely developed a contingency plan. The strategy, in addition to pre-planned safe havens, involved a ‘shake down’ stretch of tunnel running under no buildings. If problems did occur, repairs to the TBM could be made by sinking a surface access shaft at this location. Unfortunately the need for that repair event occurred shortly after the machine commenced excavation. The reasons for the failure of the cutterhead seals, and, potentially, the cutterhead main bearing, are yet to be determined. I doubt there will be any signs of failure of the main bearing when the crews get a chance to inspect it. However, all parties involved are wisely taking precautions and installing a new main bearing in addition to the seals. Seattle Tunnel Partners and WSDOT have in place a panel of experts to advise them on the highly technical details of the TBM design. I personally know several of these experts and they are well qualified to recommend and supervise the necessary repairs and procedures to get the TBM into a condition where it is able to finish this tunnel. Having been in the TBM supply business for quite a few years, I unfortunately have to admit having been in a similar (fortunately not as well-published!) situation as the TBM supplier, and on more than one occasion. This situation, involving significant TBM problems at the beginning of a TBM drive, can result from many different factors and is not unique to the SR99 project. In fact, Robbins recently had a similar situation (admittedly on a smaller scale in terms of both public and financial impact) on a project in Turkey known as the Kargi HEPP. Despite extensive pre-planning, unexpected ground was encountered, which resulted in several in-tunnel stops and machine modifications in the first few hundred meters of the tunnel. What happens in these situations is that you pull in the best minds with the most experience and immediately analyze the problem. The ultimate fix often ends up as a multi-level solution. You must ensure you have the problem under control, plus, take additional measures to monitor the vulnerable components and operating procedures. At Kargi, this process resulted in the remainder of the project being finished without significant TBM problems. Without a doubt a similar process is going on at SR99 with Hitachi Zosen engineers, the contractor’s specialists, and the city’s board of experts. Being one who is keenly interested in this project, I believe that this TBM will soon be back to boring with a new completion date, which will be fulfilled. I am optimistic that this project will one day be seen as a positive in the tunneling industry, and one during which many lessons will have been learned and many advancements made. Such advancements will be put to use in Seattle and in other cities that will benefit greatly from the excavation of more underground infrastructure. The parking lot for the Green Line’s Norwalk Station has 1,792 spaces — and all of them are filled on most weekdays. Photo by Steve Hymon/Metro. Why? The CVC doesn’t provide Metro much flexibility in writing rules that are particular to the parking lots and garages at its stations. In turn, that makes enforcement of the rules that do exist somewhat difficult, particularly enforcement of non-transit riders parking at Metro stations parking facilities. Thus, the draft parking ordinance posted above (it’s in Appendix A) accompanied by a Metro staff report. In the coming weeks, the ordinance will be circulated to the public for review. After any necessary changes are made, it will be sent to the agency’s Board of Directors for their approval. If you read the ordinance, you’ll notice that a lot of attention is given to the issue of parking fees. While all non-reserved daily spaces at Metro parking lots are currently free, the ordinance provides guidelines on how the agency may impose more parking fees in the future — should it so desire. Fees may also help manage demand for parking at some of the most notoriously difficult parking lots in the Metro system in the same way that parking meters and garages with variable pricing helps balance supply and demand. Fees may also be a source of funding expanded parking at the most impacted stations, as well as helping restrict non-transit use at some lots and making lots safer. A decision to charge for all parking would ultimately up to the agency’s Board of Directors. The parking ordinance and fee resolution is currently being circulated for review and will be considered by the Board in their April round of meetings. As part of the ordinance, there’s a Board resolution to establish daily and monthly fees for preferred parking at some stations (Appendix B on the above document). The fees are typically $4 for daily preferred parking and between $20 and $59 for monthly spots, depending on the station location. This represents no change to the existing fees. What do you think of parking at Metro stations? Is it necessary? Or a necessary evil? Should parking fees be commonplace? Or would that (pun intended) drive away would-be riders? Comment please. Michael Horodniceanu leads a tour of the ongoing Second Avenue construction. The only New York politician in recent memory who’s attempted to grapple with the issue is New York City comptroller Scott Stringer, who noted in a speech back in 2011, when he was running for mayor, “The first phase of the Second Avenue subway is costing $2.7 billion per mile of new tunnel. The Pasadena Working Group has sent its recommendations to Pasadena Mayor Bill Bogaard and City Manager Michael J. Beck regarding the Metro/Caltrans State Route 710 North Study. The Working Group’s report will be discussed at the Pasadena City Council meeting April 13, 2015 at the Pasadena Convention Center, 300 E. Green Street, beginning at 6:30 p.m.
Mark your calendars. Below is a calendar of three events taking place this month. If your schedule can only fit in one meeting: You are needed at the Pasadena City Council meeting on Monday April 13th @ 6:30pm. 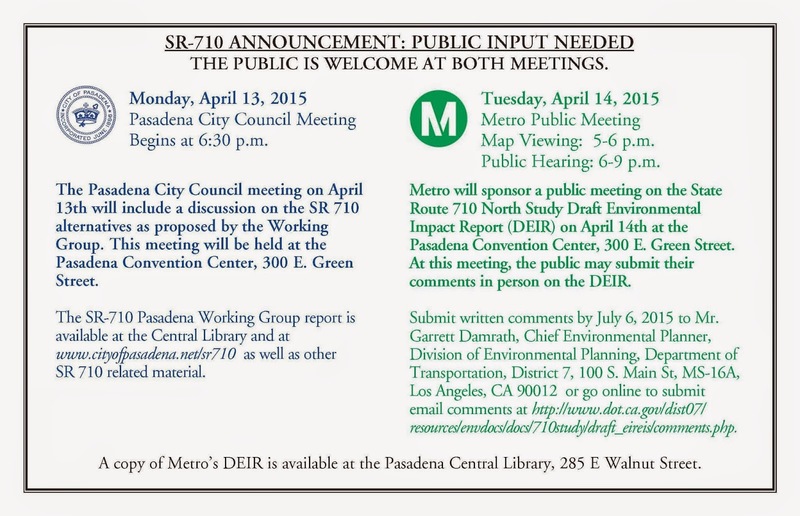 There will be plenty of speakers, we need an audience to support the No 710 Tunnel side as well as the Pasadena SR-710 Working Group (more information provided under item 2 below). The City of Pasadena has an announcement postcard for the two meetings in Pasadena. The attached postcard has been prepared by the Public Information Office and distributed to Pasadena Council members and Pasadena Public Libraries. SR-710 Public Hearings: It is not necessary to be there the entire time. You can stop by and take a look at the maps and ask the SR-710 Engineers questions. Go to no710.com and click on the yellow button “Sign the Petition” located on the left hand sign of the home page. All you need is an email address to sign the petition.